Originally founded in 2002 by Jeremy Lin, Metricu Technology is a highly professional manufacturer in the field of testing equipments. 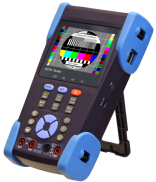 Its product line covers a full range from cctv tester to ip camera tester, HD-SDI tester, HD-CVI tester, HD-TVI tester, as well as AHD tester. All are very useful and convenient when installing, maintaining and troubleshooting analog cctv camera, ip camera, HD-SDI camera, HD-CVI camera, HD-TVI camera, AHD camera, video surveillance.